After having more expensive irons that left me less then satisfied I purchased a Sunbeam 4328 Professional Iron because a good friend recommended it. I really like the digital controls and I found them very simple to use. The Sunbeam is a good light weight and makes ironing very easy for me. I especially like the the easy control of the steam and you can easily change from any one of 4 types of steaming. I found all of the steam operations to work well and liked the spray mist the best for my types of clothes. However the steam blast is an awesome option as well. The only negative is that sometimes I have had some water dripping from the iron but not enough to cause me any real problems. The iron comes with a little plastic cup for the water which is really a good idea. The sunbeam also has a teflon bottom plate and it seems to work just fine as I have had no problems with it at all. I also really like the pointed front to help get into some tough spots to iron. Having an automatic turn off is really a great idea and a very important safety feature. The Sunbeam turns itself off automatically after just 15 minutes. The last Iron I had I don't believe had an automatic turn off or it took hours to turn off and I was always a little concerned about the chance of fire. 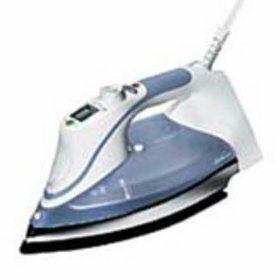 Overall I think this Sunbeam is a great iron and has easy to use features that make my ironing as easy as possible. I would recommend it over more expensive steam irons that cost almost twice as much.